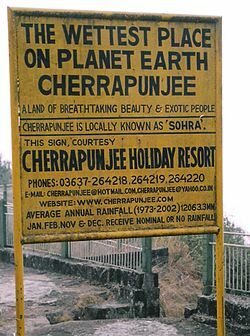 Cherrapunji, Nov 1 : Known for being the wettest place on earth, this sleepy Meghalaya town near the India-Bangladesh border has attracted some top-notch companies of the world who are testing their products here. The tag “Cherrapunji,” known previously as Sohra, is said to work wonders for the companies’ new products, which the buyers instantly associate with trustworthiness and quality. “Tested in the wettest place on earth in monsoons” — so goes the blurb in an advertisement for Italian-made Geox waterproof shoes, an amphibious shoe line. Sohra has an average annual rainfall of about 12,000 mm and by comparison, Hartley Bay, one of the rainiest places in Canada has an annual rainfall of about 4,500 mm. The highest recorded total annual rainfall was 24,555 mm in 1974. The maximum for a single day was recorded in 1876 when 1,040 mm fell in 24 hours. Sohra also holds the world record for a month’s rainfall when 9,300 mm fell in July 1861. Venice tour guide Andrea D’Alpaos, Spanish lawyer David Subirats, Swiss photographer Claudia Leisinger and British ski instructor Rob Spears were recruited by Geox to test its waterproof shoe range in June. Also, Yamaha sent three of its newly launched gearless scooters here to test the drive-worthiness of their machines. While Yamaha is keeping the exercise under wraps, sources say the company is likely to feature it in their upcoming commercials. Apart from this, there are a host of other companies lined up to exploit Meghalaya’s scenic beauty and the ideal location for shoots. The reason behind this rush, Pradip Sadarangani, an associate professor at IIM-Shillong said, was because “Cherrapunji” is a name that everybody seems to know. “Our human minds work on association with time, place, things and persons. When we associate a known place with a new product, it helps our mind identify the product easier,” he said. A marketing expert, Sadarangani, thinks there are other places in Meghalaya that could also serve advertisers. “Advertisers can take note of places like Mawlynnong, the cleanest village in Asia, and the serene 18-hole natural golf course in Shillong,” Pradip said.